This new addition 'aims' to please and is ready for anything. Don't be afraid to let them know you mean business! Semper Fi! 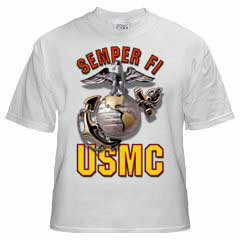 Show your Marine Corps pride! 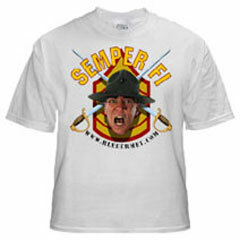 This is an R. Lee Ermey EXCLUSIVE! (Eagle, Globe and Anchor for you civilians) displayed PROMINENTLY and PROUDLY! OOORAH!! R. Lee Ermey's 'DEVIL DOGS'! Another great R. Lee Ermey EXCLUSIVE! Show your proud to be a Marine or just show you mean business, the DEVIL DOG says it all. The French Army Knife T-shirt really shows the French's TRUE SPIRIT!!! It comes complete with a cork screw for whatever size of wine they need to start with before they finally give up! Make sure you have this on the next time you order FRIES!!! 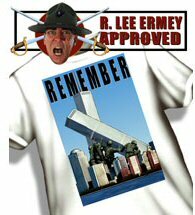 Be the first to get your OFFICIAL R. Lee Ermey Fan Club shirt. Be the envy of all your friends! This is the 'PERFECT' shirt to show you REMEMBER 911. Wear this one proudly! It has the Gunny's Seal of Approval! You will ONLY find these for sale here! *International orders add $30.00 Canadian orders add an additional $5.00. * NO REFUNDS on T-shirts.